Human Reasoning or God’s Standard’s? 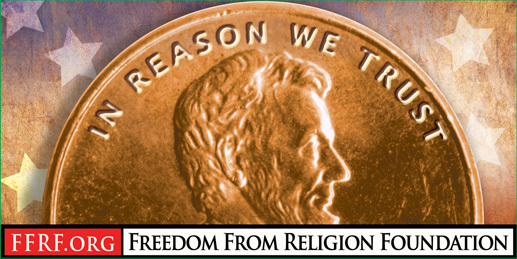 The “Freedom of Religion Organization” http://www.forf.org a very outspoken Anti-theist group has been lobbying for some time now to have “In God we Trust” removed from our currency. They absolutely see no problem with: “In Reason We Trust which would take away the faith in God and “religion.” They instead like to replace it with a humanistic secular world viewpoint. The believe is that “human reasoning” will set the world free from the oppression that “religion” places on today’s society. Hawkins and other Anti-theist like him i.e. Richard Dawkins and Christopher Hitchens love to proclaim boldly that God does not exist and that He is not needed. They claim religion has suppressed the freedom of the people and is hindering the progress of a new society that is freed from God and religious zealots. They believe that with reasoning and humanist thinking the world will be a better place one day. If we can only silence the “people of faith” then we can all live together in peace and harmony just as John Lennon envisioned it in his song “Imagine”. Do we set moral values from the viewpoint of man or from the viewpoint of God? God has given mankind moral values that cannot be denied and every human has those values written on their hearts, we intuitively know when we are doing something wrong. Our conscience bears witness to the fact. God has given us the 10 commandments, you shall not murder steal, lie, commit adultery, coveting your neighbors goods and so on. These are all good moral values and I believe that not many would disagree with them. However many do not want to obey them, or are trying to get around them with some human philosophy. In their moral world God’s views are obsolete, they agree that murdering somebody is wrong and needs to be punished, they would also agree that stealing and lying is wrong. Humanistic thinkers look on the outside of man, God however looks inside at the heart of man, and it was Jesus that demonstrated to us how God looks at His perfect and moral standards. Jesus did not abolish the 10 commandments as many like to think, He took them and raised them up a notch. Showing that God does not look at the outside appearance of man but at the heart. Many will say, “I have never murdered anyone.” Jesus said: if you hate your brother, you have already committed murder in your heart. That person may not have murdered anybody physically, but he/she may have hated someone wishing them to be dead. In the eyes of God that is just like murdering someone. From the heart comes all evil thinking, from the heart comes murder, theft, lies and covetousness. It is a heart issue. God declares in Jeremiah: “The heart is deceitful above all things, and desperately wicked; who can know it?” Jer. 17:9. God declares every human being guilty of sin. The word sin is not very much liked these days, but what the word sin really means is “missed the mark, or “fallen short.” God declares in His word that we have all missed the mark and have fallen short of His glory. Therefore man will make all kinds of excuses for their actions, society is to blame, religion is to blame, politicians are to blame. “If we would just have more tolerance towards one another”. “If we would not be so narrow-minded about things, the world would be a much better place to live in”. Jesus said: “Enter by the narrow gate; for wide is the gate and broad is the way that leads to destruction, and there are many who go in by it. “Because narrow is the gate and difficult is the way which leads to life, and there are few who find it.” Mat 7:13, 14. In my opinion, I rather go the narrow way. I believe that if we let go of God and His perfect standards and rather put our trust in humanity and human reasoning, today’s society will face dire consequences in the future. Every Kingdom or Empire that let go of their moral values in the past has perished. Humanist today want to replace God’s wisdom with a humanistic atheistic philosophy. They simply deny the existence of God and do not acknowledge Him. One day the ultimate Judge will have the last word and no human excuses will ever hold up before the throne of God. Man’s wisdom is foolishness before God. It is never too late to turn and embrace God. Today is the day of salvation. God is waiting patiently and He is longsuffering towards mankind, wanting nobody to perish. P.S. True Biblical Christianity is not a “religion, but a meaningful loving relationship with God through Jesus Christ. Author Media 4 Life MinistriesPosted on November 20, 2011 July 29, 2018 Categories Apologetics, Believe, Bible, Biblical Perspectives, Christianity, Faith, Jesus Christ, John 3:16, Salvation, Spiritual, Truth, WisdomTags Bible, Christ, Christ Jesus, Christian, Christianity, Christopher Hitchens, forgiveness, God, Holy Spirit, Jesus, Jesus Christ, John 3:16, John Lennon, Lord, Love, mercy, Messiah, Religion, Richard Dawkins, Savior, sin, truth, Value theory6 Comments on Human Reasoning or God’s Standard’s?